What Accessories are needed in the photo booth? In order to determine what Accessories will be useful it is best to try and think of what risk factors you may face when using your photo booth during actual events. 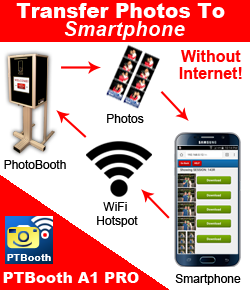 Many of these factors will depend on the particular photo booth design and situation. For example, is the photo booth stationary or mobile? Where will it be located at the event? etc. The following is a list of the major risk factors that we experienced after our photo booth was built. Let’s look at these major factors and what solutions we have implemented to reduce/eliminate these risks by adding some necessary Accessories. When we started operating our photo booth in 2008 we can definitely say that the preventive thinking we used from the start has saved the day numerous times. During actual events, your Photo Booth components will be utilizing electricity (amps, watts, volts) at certain levels. The manufacturer of each component has provided the minimum safe values of amps, watts, volts required to operate those devices. The problem is that some situations during events are less than ideal and unless you are prepared your equipment may not function properly or even at all. The first Accessory that we added to our photo booth was the UPS battery backup. Battery Backups provide an uninterruptible power supply – (UPS). Trust us when we say that the UPS battery backup will be worth every penny. The UPS battery backup will save your equipment from failure should there be a sudden loss of power. It will also compensate for the low voltage depending on your UPS model. What to look for when choosing the UPS battery backup. It is important that you are aware of the combined values of amps, watts, volts that your equipment will require to operate. For example: Our Printer is the Sony UPDR 200. This printer has a large power demand and requires 110V and 5A to operate. By using the Volts / Watts / Amps Converter we have determined that the printer will require 550 watts (Watts = Amps x Volts) in order to operate. Based on the calculations we needed the UPS with the minimum of 550 watts capacity. Keep in mind that we are not talking about power generator. We are talking about the power source that will save your operation if a sudden power outage occurs or electricity values are not stable. Always remember that it is a good idea to test your UPS battery backup at home before the events to make sure it is operational. Take some time to do some research on the internet for the UPS battery backup that suits your needs best. When a camera loses its power it triggers errors and makes the photo booth software unresponsive. The camera battery has a time limit. How long your camera battery will last depends on the battery type, age and capacity. Eventually it will not be able to provide sufficient power to operate the camera. Some cameras drain battery power faster when they are used while plugged into a computer. As you can see, it is very important that your camera stays ON at all times. To ensure this you can buy a camera power adaptor (recommended) or a camera battery of large capacity. For us it was no-brainer, our second Accessory that we added was the camera power adapter. We use the Canon Powershot S5 IS and this camera was designed to be used with both the 4AA batteries and the camera power adapter. What to look for when choosing the camera power adapter. Make sure you get the right power adapter that meets the requirements of the camera manufacturer. We recommend getting the original camera power adapter and not the aftermarket. For us, the original Canon camera power adapter was more expensive but we were not willing to take a chance on quality. We have learned that in the hard way. You may be wondering how obtaining Consistent Pictures Quality has anything to do with the Accessories. It’s actually the Accessory that makes consistent picture quality possible every time. The particular accessory we are talking about is an External Camera Flash. Why get an external camera flash? The camera flash is responsible for eliminating the blur caused by the movement of people/subjects that are being photographed. So the natural question is why not just use the built-in camera flash? In some cameras the built-in flash is not powerful enough for particular situations. The built-in camera flash in most cameras does not have the ability to recharge to full capacity in the short time between the photo booth sequence shots. Should the built-in camera flash stop functioning there is no replacement that could be immediately used. This is why the most practical solution is to use an External Camera Flash. Note: In order to accommodate an external flash your camera must have a “Hot Shoe” adapter. What to look for when choosing an External Camera Flash. Ideally you will want to use an external flash that is the same brand as your camera. For example we recommend using a Canon External Flash if you are using a Canon camera. We also recommend getting an External Flash that has its own AC power adapter. There is only one brand that offers the AC power supply in addition to the standard battery power. If you are getting a standard battery operated External Flash, We recommend getting the External Flash that uses 4 batteries. Do some research on the internet to determine what External Flash will be appropriate to use in your particular case. The factors to consider are the distance to the photographed subject and how much light you have before taking the photo (dark scenes will require a more powerful flash opposed to well-lit scenes). We have found that rechargeable batteries are the best to use in an External Flash. We currently use the Canon Speedlite 220 EX that uses 4 AA batteries. When we are using regular batteries we get approximately 100-150 flashes as opposed to 350 using the rechargeable batteries. It almost goes without saying how important it is to maintain reliable connectivity of all your devices with your computer. In our photo booth we have three USB cords and one VGA cable that we use. These cords are used to connect our camera, printer and touchscreen monitor to our laptop. We also have a laptop power adapter, monitor power adapter, camera power adapter and two power cords for the power adapters. We often take these cords for granted because they are so small and seem to be insignificant in the grand scheme of the photo booth structure. Make no mistake! The cords are very important, they are like a veins in your body. The worst thing about the cords is that most of the time when they malfunction there are no visible signs of damage. As a result it will appear that you have everything connected but you getting no response. Fortunately the solution is cheap and effective. As part of our Accessories we carry with us two backup sets of all cables, power cords and power adapters as well. Since 2008 we have had three instances in which we have had to replace faulty cords while setting up for an event. Bottom line, always have backups. If your photo booth is the mobile type and designed to be transported to the events the mode of transportation will be critical. Whatever mode of transportation you choose, the objective is to ensure that your photo booth arrives to its destination undamaged and in perfect working condition. The investments we have made in protecting the equipment has paid off many times. Protecting your equipment can be an expensive investment. Some cases could cost as much as $700.00 per case. The investment you have made in your photo booth equipment is too important to let it go out unprotected. We can’t recommend enough that you purchase cases or other type of protection for all of your photo booth equipment. In closing, we hope this article will help you to make sound decisions when it comes to buying and using Accessories for your Photo Booth.